﻿ What is the difference between the SFP port and the Combo port? What is the difference between the SFP port and the Combo port? What is a Combo port? Combo interface, also known as optoelectronic multiplexing interface, is the switch device panel on the two Ethernet ports (an optical port and an electrical port). Combo electrical port and its corresponding optical port is logically multiplexed, the user can choose according to the actual network of one of the use, but they can not work at the same time. When one of the port is activated, the other port is automatically disabled. What is the SFP port? SFP port is a subset of Gigabit Ethernet, when the SFP port using fiber Gigabit link, it is Gigabit Ethernet; in the Ethernet switch, regardless of the electrical port, optical port link layer with a protocol, the only difference is physical layer, that is media; SFP is a description of the physical layer. SFP port can be used to plug the SFP module, plug in the electrical port SFP module can be used when the electrical port, you can connect the network cable; if plugged in the SFP module can be used when the optical port, you can connect the fiber. 1.You can use a pair of twisted-line ports or SFP slots for combination port pairs, but not at the same time. 2.If you connect a combination port pair to a network device with a twisted port and an SFP slot, the SFP slot is preferred and the twisted pair port is blocked. 3.The SFP slot becomes active when the SFP transceiver is established on a link to a network device. 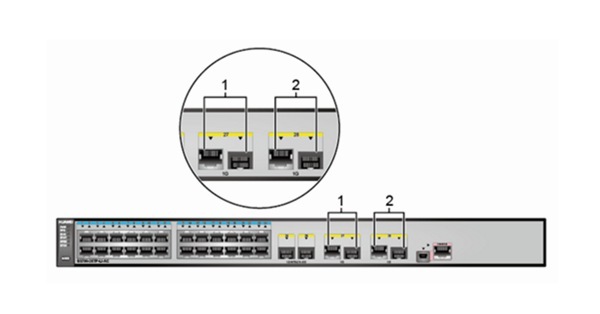 4.Combination port pairs of twisted-pair and SFP slots share the same settings, such as VLAN (virtual LAN) allocations, access control lists, and spanning trees.